My family often moan when I serve up new things for supper. 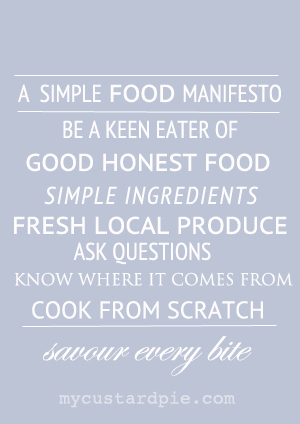 If I had my way I’d try out several new recipes every week, but they prefer tried and tested favourites. Breakfast time is where I need repetition. Decision-making and creativity has to be channeled elsewhere that early in the morning. Different choices are reserved for the weekends; so when the dogs are walked, the girls have left on the school bus and there’s a short gap before I hit my desk I usually reach for the toaster. The bread has to be substantial and I slice and freeze the nuttiest, grainiest bread that I make or buy. La Cuisine de Sarah threw down the Fresh From the Oven gauntlet with a breakfast fruit loaf and I’m so obsessed with Dan Lepard’s bread at the moment that I thought I’d have a tinker with something in Short and Sweet. While the oven is hot it’s more efficient to bake two loaves so I made Dan’s multi-grain and honey loaf and did a breakfast riff on a second batch of dough. Breakfast equals marmalade…so what about using it in the dough? Would dried sour cherries and some almonds go with the orangey flavour? There was only one way to find out. This uses the half-sponge method which means mixing some flour, water and a small amount of yeast and leaving it overnight for the flavours to develop by maturing slowly. A sort of porridge is added for texture too. Forget toning up your ‘bingo wings’ as Dan espouses a short and gentle manipulation of the dough rather than heavy kneading. The fruit loaf dough was much stickier to work with but I managed with a well oiled work top and a few extra gentle kneads. I was surprised at how completely different the loaves were from each other. 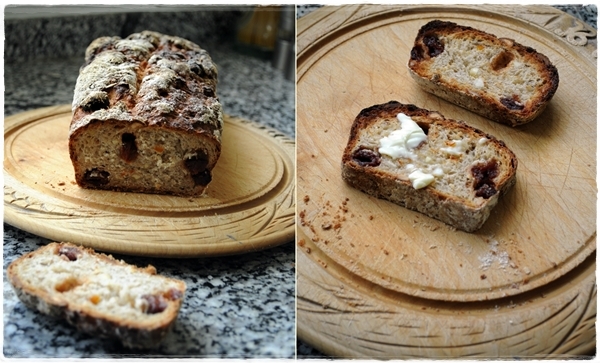 The multigrain was very chewy and wholesome, the fruit loaf lighter and really good toasted and spread with butter. That’s breakfast decision-making taken care of for a couple of weeks. Make the sponge: Stir the yeast into the warm water in a large bowl and then add the flour gently stirring until combined. Cover with clingfilm and leave overnight. Make the oat mixture: Put the oats, marmalade, dried sour cherries and almonds in a bowl and pour in the boiling water. Stir to combine and leave to cool (you can do this the night before too). Make the dough: The next day, scrape the oat mixture into the sponge mixture and beat well. Put the strong white flour, the wholemeal flour, the salt and the butter (from the dough ingredients) into a large mixing bowl. Rub in the butter with your fingers until no lumps remain. Scrape the oaty, sponge mix into the flour and form into a sticky ball of dough. If you have a free standing mixer with a paddle attachment and dough hook you can combine the flours, rub in the butter (with the paddle) then mix together with the dough hook – I use a KitchenAid. Cover the bowl with a tea towel or cling film and leave for 10 minutes to rest. Use Dan’s light kneading method to work the dough, so oil your work surface (I use olive oil) and turn the dough out and knead as per his basic techniques. Quickly rinse out the bowl and lightly oil before putting the dough back to rest for 15 minutes. Knead again, put back in the bowl, cover and rest for 30 minutes. Repeat the kneading one more time and rest in the covered bowl for another 30 minutes. You can bake this on a tray or in a loaf tin (approx 19 cm long). 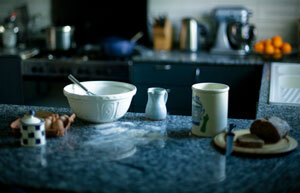 If the latter, butter and flour it and also lightly flour your work surface. Using a floured rolling pin, roll the dough out into a rectangle about 2cm thick. The width should be the shorter side and measure slightly less than the length of the tin. Roll up tightly from the bottom to the top, and place it with the seam side down inside the tin or on a baking tray. Cover with a floured tea towel until half its size again (about 3/4 hour). While it is proving preheat the oven to 220 C / 425 F/ gas 7 (or 240 C if your oven will heat up that much). Slash the loaf on top (I found it deflated a bit so this is optional). Put in the oven and immediately give a few squirts with a water spray. Close the door quickly and bake for 20 minutes, then reduce the heat to 200 C and bake for a further 20 minutes – just watch it doesn’t get too dark. Cool on a wire rack and eat while just warm from the oven. Also great toasted spread with butter and marmalade. If you fancy baking a fruit loaf do check out Sarah’s recipe plus read more about Fresh From the Oven on Utterly Scrummy, where this month’s roundup will be posted at the end of May. Do you stick to the same old favourites for breakfast or ring the changes? Ohh my goodness this bread looks amazing! Sally that looks seeeeeeriously good!! That loaf looks so so good. The photos are lovely. It is an interesting thought to slice and freeze your favourite breads so that there is no rush to use it quickly. I am hosting FFTO for the month of June. Looking forward to that. Frozen sliced bread is the ultimate convenience food – and it goes directly into the toaster. As my teens won’t touch seedy bread it means I can still have my favourite. Can’t wait to see what your challenge is. I struggle to eat breakfast first thing. My children have such radically different tastes to each other in the mornings that it seems to take all the available time to sort them out. The result is that I forget to eat. 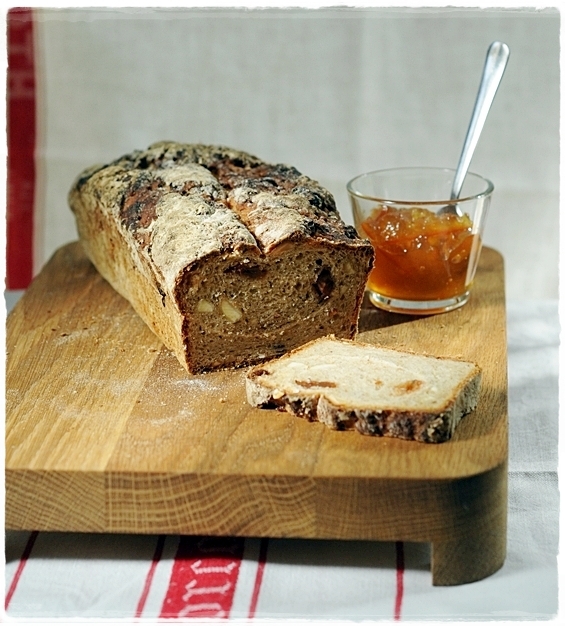 But your beautiful marmalade loaf looks so appetising and inviting – just what I need. I am, by the way, now paranoid about bingo wings. What a frighteningly vivid description! Our days start very early here in the UAE so I know what you mean about struggling to eat breakfast first thing. Working from home means I can pack them all off and then eat mine at a more civilised hour (although it’s easy to get caught up in work and suddenly it’s lunchtime). I’m now feeling guilty as my children get their own breakfast! Magnificent! 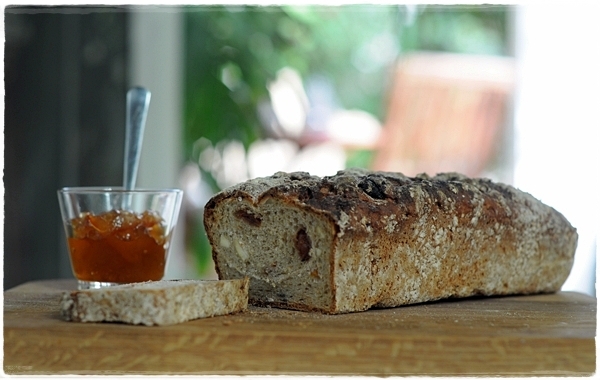 I have never ventured to making bread quite like this before – think I should brave it soon. It’s very rewarding – let me know if you give it a try. Yummy. Sour cherries, marmalade and almonds, my favourites. That slice of bread at the top looks like it’s smiling, or even winking! Can’t blame it. 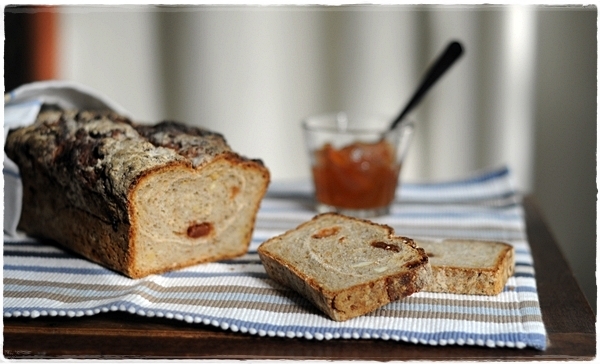 Fruity Breakfast breads are indeed a sweet treat. I remember my Ma baking fresh bread in the morning and how exciting it felt to be in a home in which bread is made. Useful info as well! How lovely Kari. My Mum cooked everything but bread, which was delivered fresh daily by the baker’s van. PS loved your post about marrying a chef! I’m intrigued by these breads, Sally. Dan Lepard is a genius baker in my book. I would love to give these a try! I’ve found these breads more accessible than the recipes in the Handmade loaf and everything else in Short and Sweet has come out really well. Have made the red wine and walnut loaf a lot. Fruits, bread making, breakfast and me time after everyone is out: the ingredients of a recipe I love to make 🙂 yup the life of toasted slices and generous servings of marmalade what’s not to love? 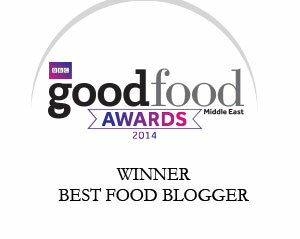 Thanks Dima (and for the award). I agree that bread making is particularly nice when you have the house to yourself. Both loaves look absolutely lovely Sally! My monotonous meal is often lunch-it’s easy to bake the same loaf each week and make up similar sandwiches…but I love to vary my dinners and breakfasts so this would be perfect. Love the idea of incorporating marmalade too! I know what you mean about a regular sandwich too especially when you are busy. The marmalade did work really well I’m glad to say. Home-baked bread! Ah, I was so inspired when I read your last post mentioning the multigrain and honey bread, so I don’t know why I haven’t got around to baking anything yet. 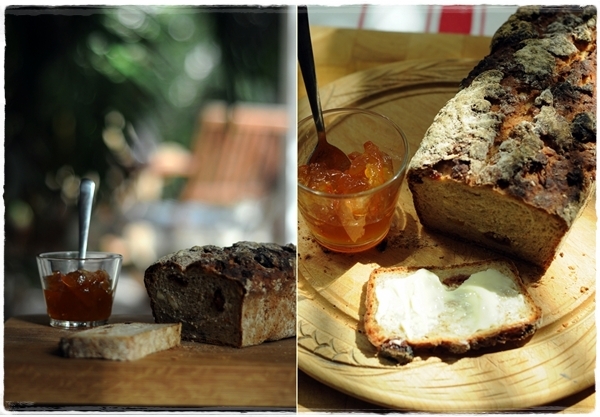 Oh and how I love marmalade…you’re so daring to have experimented on a bread recipe! Carby, sourish flavours…I need to get off my behind and make this happen. I love this kind of recipe – it really is easy. The gentle approach to kneading means it’s very methodical and soothing. Come over and make some with me. How lovely this bread would be warm with great lashings of butter. Homemade bread? Is there anything better? What a lovely recipe. I need to make this. I like the use of a sponge for some depth of flavor. Agreed. I make most of my bread this way these days. It means you use less yeast too. Thanks for the comment. 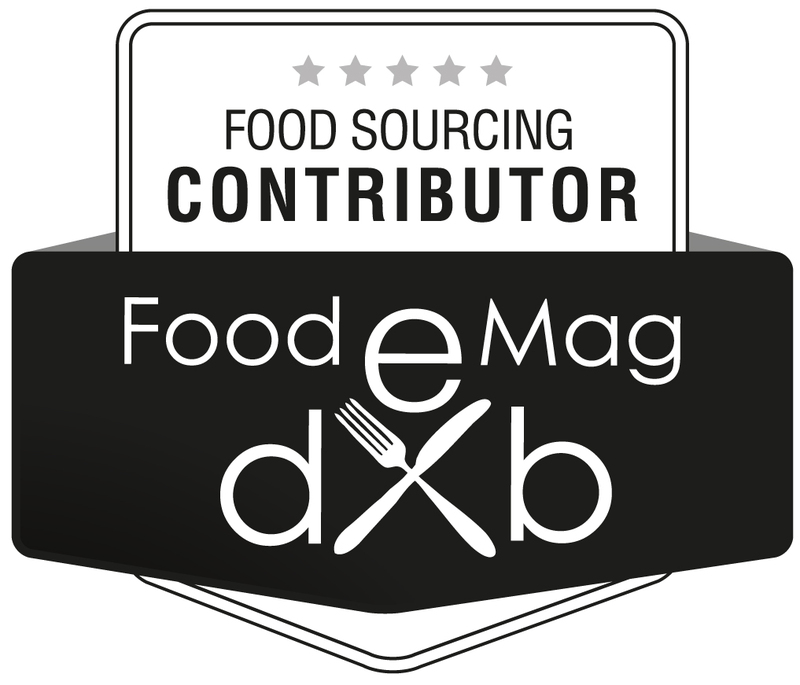 Downloadable food as a app – someone should do it! Wow, your recipe is an amazing adaptation. I think I have to bake a loaf of bread today! Those look really good, Sally! And I’m sure the entire house smelled fantastic while you were baking these bread. I should have mentioned that – you are right, it smelled wonderful. Sally, Ah can I steal the sunlight streaming in while Chirag steals the loaf? 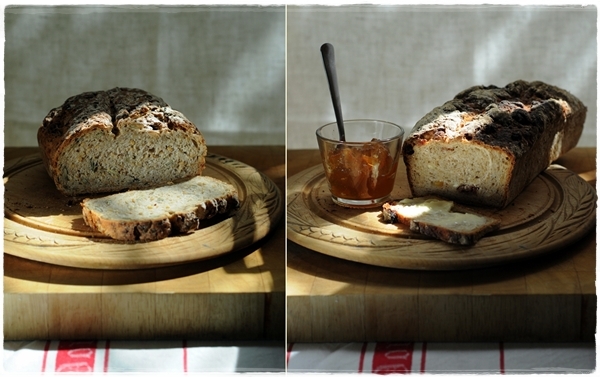 The loaf, the marmalade – both are so enticing. May I just share (this is hardly sharing, this is like spilling out all the beans) my weakness – I love extreme food experiments but am very nervous about baking, probably because it requires a lot of precision… as much as I enjoyed reading the post I’m also dead sure that I’ll probably end up being the ‘loafer’ rather than making the ‘loaf’! I’ve found that the Fresh From the Oven challenge over the last few years has given me new confidence with baking with yeast. The need for precise measurements made me nervous about tinkering before. Both loaves look delicious. You just can’t beat homemade bread, whatever it is. Dan’s book is fabulous. Bread wise, I’ve only made the tea cakes so far and it did seem a bit counter intuitive not kneading the bread, just turning and folding. But they worked amazingly well. It seems to transform the dough in a way I never expected. o boy…what a great looking loaf! oh my god…this is the best bread that i have come across today….its fantastic. i loveeed the crust on the bread. awesome stuff! I was wondering what to do with the sour cherries in my fridge! And all of the marmalade! Fabulous! Oh my family is rarely happy when I serve something new – they also always prefer the tried and true! But a great snack bread is always appreciated and this does look like the perfect mid-morning snack! Oh this sounds like a divine way to start your morning. I can practically smell it through the screen! Hungry now, and no fruity loaves on hand. Must bake soon. Thanks for the inspiration. Such a beautiful, and inviting loaf! Your photography is so great as well, you really bring out the beauty in food.